The future of computing is hybrid. Phones have become tablets. Tablets have become desktop computers with keyboards. Hell, Microsoft even made Windows phones powerful enough to be used as full-fledged PCs. Bottom line: A gadget in 2016 needs to be flexible. That’s why Google bringing every single Android app to Chrome would be such a big deal. The option almost immediately disappeared, but not before rekindling intrigue among fans. If this is a forthcoming feature that Google accidentally leaked ahead of its developer conference next month, it would be a huge deal. Creating an easy way to run Android apps on a Chrome device would be a big upgrade over the limiting Apps Runtime for Chrome, which currently only works for a few lucky programs. There are other headache-inducing work arounds, but not the kind of native Google Play apps support you’re getting here. Aside from the obvious benefits to normal Chromebooks, tablets could be the big winners from this software mash-up. Android itself has always been the problem when it comes to Google-powered tablets. Until Android N, which isn’t even publicly available yet, people couldn’t use two apps at once or make app windows smaller. It’s one of the main reasons why Samsung tablets, and now to a certain degree iPads, are more work-friendly. On the flip side, you have Chrome OS, a lightweight laptop experience dependent on an internet connection. For what Chromebooks are, they work incredibly well. 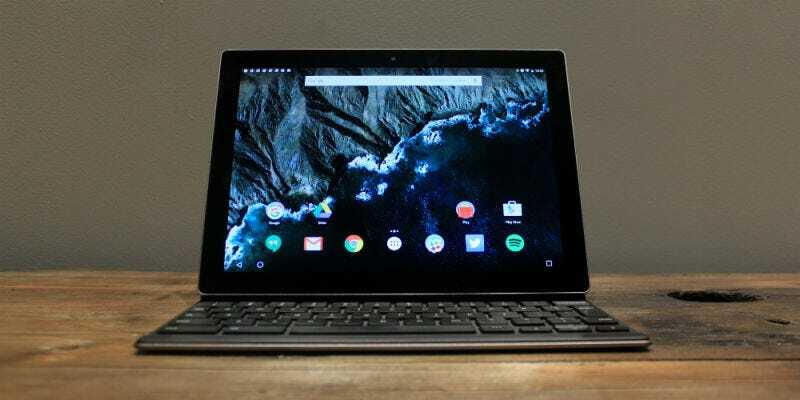 But as Microsoft’s Surface popularity grew and other 2-in-1's began blurring the line between laptop and tablet, it became obvious that Chrome OS was not built to run on touch devices. Use a Chromebook Pixel for like 10 seconds, and you’ll know what I mean. This Chrome OS update could be the foundation for whatever the hell it thinks “hybrid” means in 2016. Microsoft’s idea is basically a laptop that you can detach from its keyboard, like the Surface, and Apple’s vision is a souped-up mobile operating system attached to a keyboard, like an iPad Pro. Google, on the other hand, looks like it’s going for a third option: combining the best of both worlds. This new leak could be what Google originally had in mind for the Pixel C—a Chrome machine that can run all of Android’s million+ apps at a moment’s notice. We probably won’t know Google’s plans for certain until May 18th, the keynote for Google I/O. Anonymous sources told 9to5Google in March that Android has “something totally different” for this year’s developer conference and this would certainly fit the description.